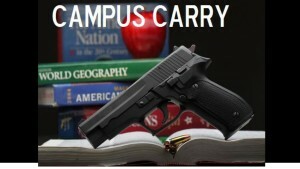 Concealed carrying of handguns on the Northeast Texas Community College campus will become legal on Aug. 1, and will be regulated by the policy now under review. A committee of faculty, staff and students worked to craft the policy, which has now been reviewed by the college attorney and President. Dr. Brad Johnson, NTCC President, has made the draft policy available on the college website www.ntcc.edu/ccdraft.pdf and asked that questions or comments be directed to his office. The next step will be a final review of the policy in light of any feedback received from the campus community in the next three weeks. A final version will be presented to the Board of Trustees at the May 23 board meeting. Once the policy is approved the College will post signs designating areas that, under the policy, will be permanent exemption zones. Temporary exemption zones will be created when certain events require such a designation. There will be information and training meetings for faculty, staff and students early in the Fall term as to implementation of this policy.